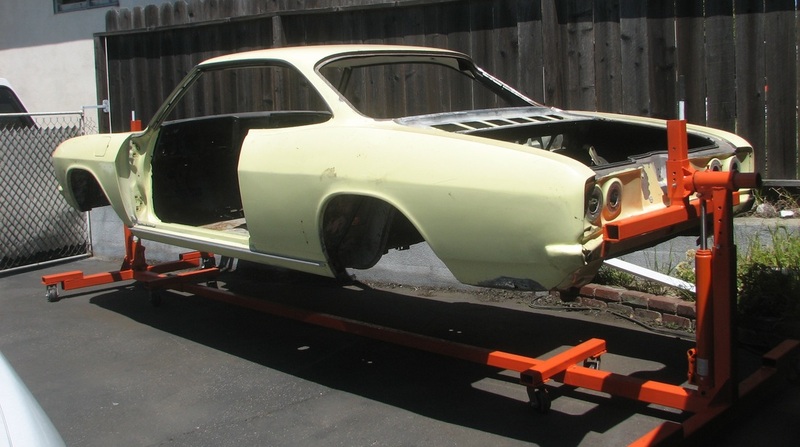 I started with a '66 Corsa rust bucket which had no trunk floor and fist sized holes below the windshield cleverly concealed with fiberglass. 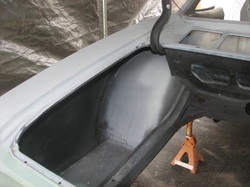 Only the roof trunk lid and hood were free of creases and dents. There are patch panels on each door and every external panel. It's now sitting on my home built rotisserie with the body work done and primer applied. 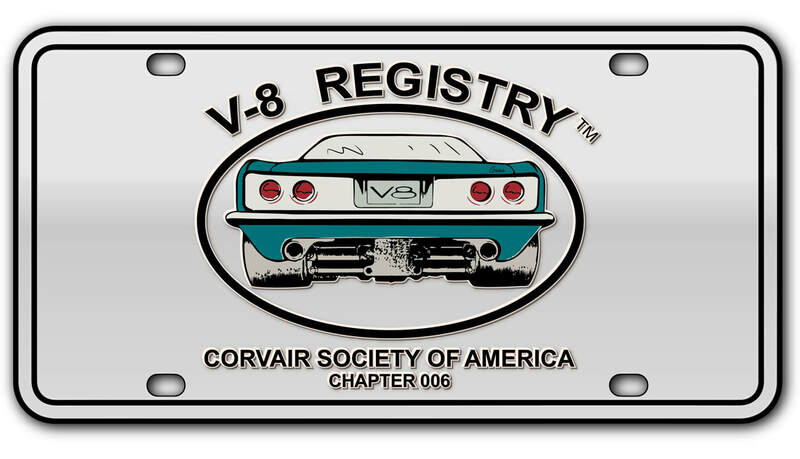 It's tubbed in the rear and will be sporting 315/35-17's on 11" rims mounted to a narrowed Corvette C5 suspension. 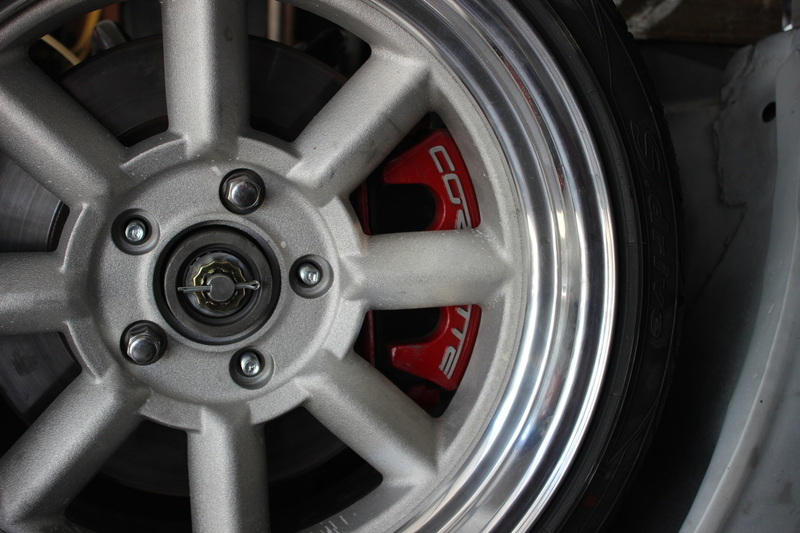 The front rides on 215/40-17's on 8" rims mounted to a Mustang II based suspension. Boosted disc brakes and air ride on each corner. The drive train will be an LS(6)? driving a Porsche 930 trans-axle in a mid engine configuration. All windows and locks are electric. Too many other mods to list! I've attached a few pictures of the tubbing and fender lip rolling. 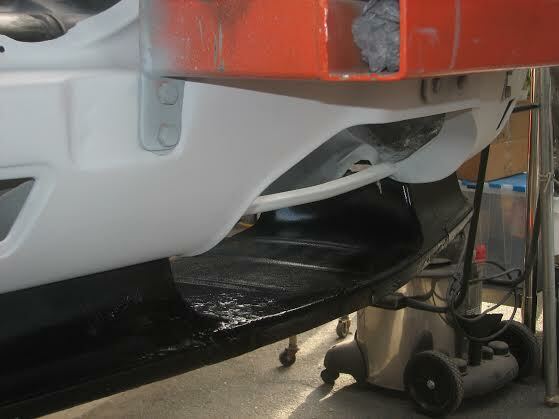 I understand Seth Emerson wrote a nice tech tip on rolling fender lips which appears in the CORSA Tech Guide. I think this is the same method. After removing the spring perch I split the rear well front to back from the bulkhead and removed the inside piece from the frame. After removing the flat section from the removed piece I trimmed the radiused part and re-attached it to the frame.…only it's three inches closer to vehicle center now. A few three inch wide strips then filled in the gap. One of the things to watch for is a reinforcing strip at the top center of the well (above the break line in the center pieces of the first photo). 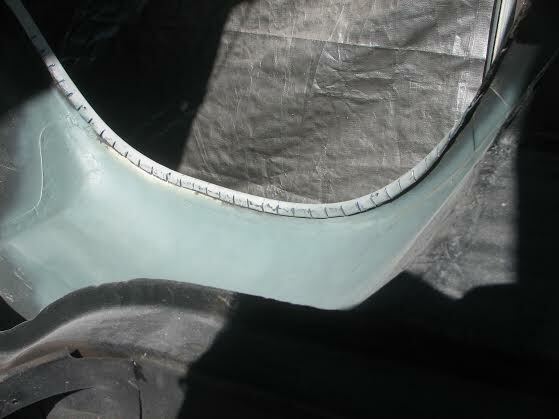 It requires some 'finesse' to remove the sheet metal from it and then trim the strip for the new radius. 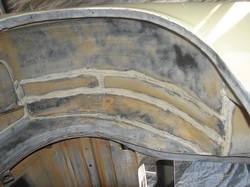 The second photo is from a rear well, but the process is the same for each end. Slices are made every inch about half way thru the inside lip. A hammer is then used to 'tune' it to the right shape and finally it all gets welded and filled. 'Top of tub' is the final result as seen from what used to be the engine compartment. With a little texture you'd never know it wasn’t stock! 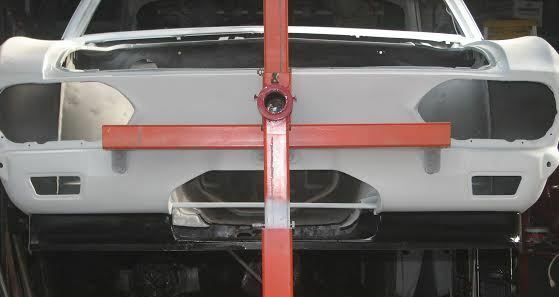 The third and fourth photos show the front opening for the radiator. There is a junction in the stock sheet metal where the upper and lower pieces are spot welded. I left enough of a vee at the front to weld in a 1/2 inch tube to form a tear drop shape and then ground to fit and look right. The radius follows the exterior sheet metal so it really looks like it belongs and also adds some rigidity to the front metal. It will also be a good back support for a screen. Just under the boxed ends of the cut there is also a steel tube following the contour, and the outline is trimmed with brake line welded on and bondoed to add a little character to the edge.. The cutout is designed to maximize the opening already in Arch's front spoilers. The fifth photo is of the unique Mustang II based front suspension with Ridetech Shockwaves and a prototype swaybar. The control arms will accept either coilovers or air. Steering uses a Flaming River Corvair quick box and custom center link and tie rods. 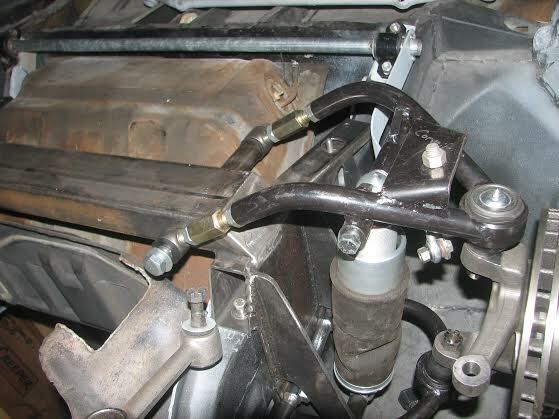 The swaybar fits either the M II or stock suspension with just a bracket change. Arch will supply both the suspension and sway bar in the future. They are both prototypes for now. There are tons of photos of rust repair, body mods etc. As things finalize I can supply better pictures nearer to the finished product. I plan on having heater/defroster/air, electric assist brake booster and many other mods. Custom front suspension and brakes are finalized, and the rear C5 sub frame has been designed and is ready for welding. Should stop well with 13" 'Vette brakes up front!